New York Times best-selling author and illustrator Peter H. Reynolds created this poster for the ECET2 National Teacher's Conference. We wanted to share it with the many creative teachers out there making a difference for their students. 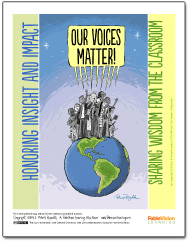 Download this poster and always remember: YOUR voice matters!If you like this poster, be sure to check out FableVision Learning's free resources page. We have a whole gallery of posters by Peter available for download!